*Drag and drop the yellow figure on the right onto the store for a virtual tour of Rainbow. Our main parking lot off 13thStreet is the most easily accessible and frequently has a line out to the street. If this lot is full you can drive around the corner to our lot located on the corner of Trainor Alley and 14th St. If it too is full, you can make a right onto Folsom and look for street parking or make a left at 12th St and park in the Soma Hub Garage. 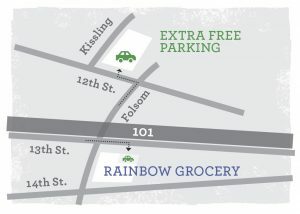 We offer Free Validated Parking at this garage located on 12th St between Folsom St and Kissling. Please be careful when entering and exiting all lots and garages. And always bring any and all valuables with you. Want Rainbow to sponsor your event or to arrange a store tour? Contact the PR Committee. Please send Donations requests to that Committee. Are you a vendor looking to schedule a demo? Click here.